It's Good Friday, and do I have something good for you! I've recently partnered with the great folks at Snake River Farms. It's no exaggeration when I say that they are the producers of some of the best beef and pork on the planet. They sent me some of their Prime Rib of Pork, and I used the opportunity to put my spin on this incredible cut, just in time for Easter. In the past I've discussed the difference between real pork and what Americans have come to know as pork. In short, the pork that you find at your local mega-mart bares about as much resemblance to real pork as a Chevy does to a Mercedes. The general form and function are the same, but the quality is vastly different. For those of you who might be thinking, "Yeah, but how much better can it really be? ", the short answer is night-and-day. Snake River Farms pork is Kurobuta which means "black hog/pig" in Japanese, which translates to heritage Berkshire hogs in English, and crazy good in foodie. Given the incredible quality of this pork I decided to do a minimal preparation so that the meat could shine on its own, so I opted for a relatively simple garlic and herb paste. For cooking I roasted it over Kingsford charcoal (a 50/50 mix of their Competition and original briquets) on the rack in my Pit Barrel Cooker. You can use whatever grill you have, or you can simply roast it in your oven. Note: My roast was bone-in, and it's traditional to French the ends of the bones for a nicer appearance. I chose not to so as to not waste any of this tremendous pork. Combine all of the ingredients, except the pork, in a medium mixing bowl and stir well to combine. 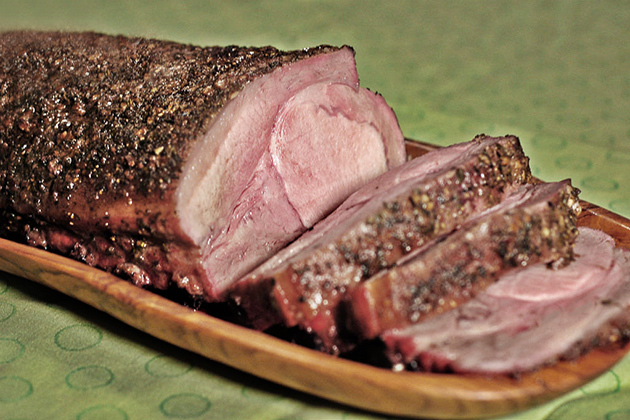 Rinse the pork under cold water and pat dry with paper towels. 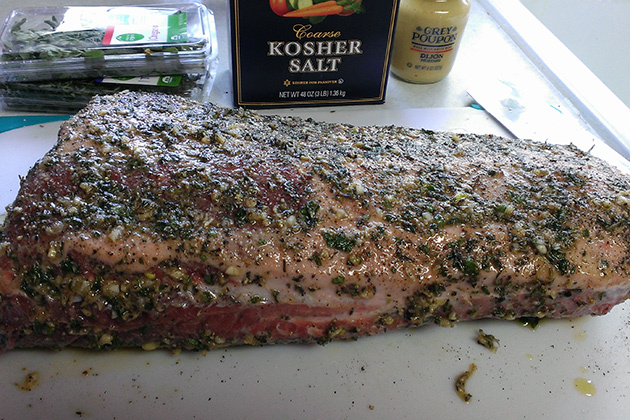 Coat the roast evenly with the herb mixture. Note: You can season and refrigerate the pork 4-6 hours in advance. Start your grill and prepare for indirect cooking over medium heat (300-350º). Grill over indirect heat until the temperature in the center of the thickest part of the roast reaches 135°. Remove the roast to a platter, tent loosely with foil and let rest 15-20 minutes. Carve into one or two-bone portions, serve and enjoy! Note: If you've cooked the pork properly it will have a pink color in the center. Pink does not mean dangerous, it means delicious. Disclaimer: I am a partner of Snake River Farms and I was compensated for this post, but the thoughts and feelings expressed here are completely my own. Regardless, their products are incredible and I recommend them very highly. Gitcha some! I've never seen such a full colored pork loin roast like that, the color difference compared to the pale pork loins of groceries is amazing. Did you trim off the bones is that a boneless version? Either way it looks good. Chris - You have got to try one of these bad boys. It was bone-in and I chose not to French the bones. I just added a note to this effect in the post. That is a beautiful piece of pork. I haven't been fortunate enough to try a Berkshire yet but you just put me one step closer to shelling out the cash. 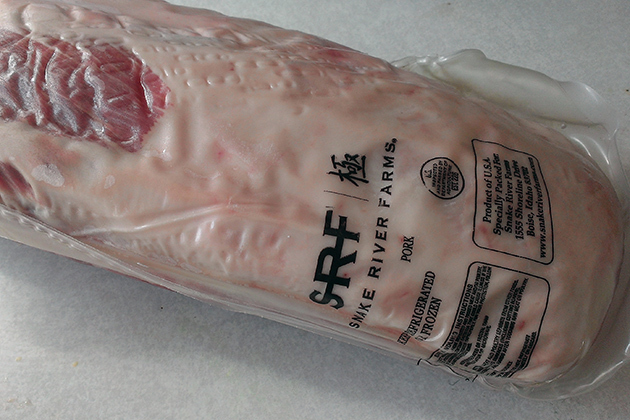 I love snake river farms, once you've had their pork loin, it is hard to go back to the stuff you get from your grocery store! What is the cook time? Wow, that does look really good. I need to try this recipe.